Military service men and women are often called upon to settle into new posts across the country, ASNS offers many free benefits to assist them in their move. 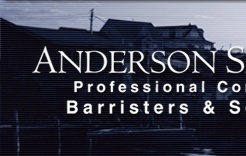 Anderson Sinclair Nova Scotia is registered with the Federal Government's Integrated Relocation Program as administered by the Brookfield Global Relocation Services for Province of Nova Scotia. Our firm, with two offices in Nova Scotia and multiple offices throughout Canada is a dedicated real estate relocation firm. Reolcation clients of Anderson Sinclair Nova Scotia enjoy benefits, advantages, and discounts. Canadian Military can register with our firm anywhere in Canada simple by going directly to our real estate website MyClosing.ca and clicking on getting started. Your fees are covered by DND IRP. We work directly with Brookfield Relocation on your behalf. For further information email Byron Balcom at bbalcom@andsinc.com for a free consultation.